Contains a 30ml bottle of Viking lens cleaner fluid, micro fibre cleaning cloth and a cleaning brush, ideal for keeping your optics clean. See below for full description. 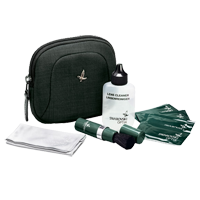 The second included item is the Viking micro fibre cleaning cloth. The cloth is made from a micro fibre material which allows it to be rough enough to help break away the emulsified liquid (when used in conjunction with cleaning fluid) but at the same time smooth enough to wipe away smudges and grease, without harming a glass surface. The third included item is a cleaning brush. This item is designed to help you gently remove larger and more stubborn foreign objects such as grit or dust particles from the chosen surface before you apply any fluid. The cleaning brush head is made from ultra soft and lightweight synthetic bristles, which are also retractable meaning it they can be kept protected and clean when not in use. 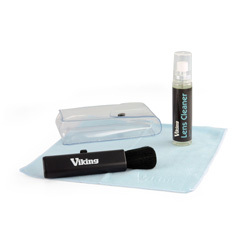 This Viking lens cleaning kit has endless application, although it is ideally suited for the cleaning and maintenance of any camera, binocular or general lens surface. It could also be used to clean the screen area on smart phones, tablets as well as any other screen that has a glass cover.